This review is a two for one special: a cooking demo AND some baked goods! First, we start with the demo, which took place at the Ferry Building Saturday market. Chef Luis Villavelazquez of Les Elements Patisserie was the guest chef. I recognized him immediately, as he sells pastries at the market on Saturdays and Thursdays, and most recently, bread on Tuesdays as well. I've enjoyed some of his chocolate chip cookies and very creative scones in the past (always made with unique flavors, with even more unique glazes on top!). He is also currently working as a consultant at La Victoria Mexican Bakery in the Mission, where he got the inspiration for the dish he was presenting, a chamomile-goat milk tea with cinnamon crisp and caramelized yellow peaches. He explained that in Mexico there is very little cow milk available, and that families have their own goats instead, and so he uses goat milk in this recipe. It also has a lot more flavor than cow's milk. His work at La Victoria is on modernizing their menu, while still keeping it fairly traditional. He is also bringing in higher end ingredients. His demo was very informative, and he taught us a number of tips, like how we could make the cookie portion of this dish in advance since it was a thin, hard style and would keep ok. He also stressed the importance of measurements and weighing in the pastry world, and how pastry is very unlike savory cooking, in that it is about precision, not about just going with what you feel. He is clearly a methodical, calm chef, and mentioned how it is important to him to take lots of notes, how he constantly is refining his recipes, and always cooks with a clean station. He was also incredibly knowledgeable, and taught us about some of the chemistry behind his work, like how food processors break up the gluten structures in dough, how the fat content of goat's milk makes it so we don't need to add cream, and how, due to the high calcium levels, we could sprinkle the fruit with pectin if we needed to cut it up in advance, and this would help protect it and cause it to not break down. 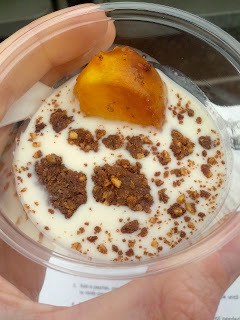 Chamomile-goat milk tea with cinnamon crisp and caramelized yellow peaches. The milk was nicely sweet, with a subtle chamomile undertone, but as I don't particularly care for goat milk, it had more goat flavor than I like. If you like goat milk however, this was probably pretty good. On top was crumbled crisp cookies and the caramelized peach. The peach was really well executed, softened but not mushy, and the caramel flavor to the glaze was really delicious and complimented the peach well. This was a rather odd dish however, and I wasn't quite sure what to do with it. Do you drink it? Spoon it? It was somewhat like the end of a bowl of cereal, where you have flavorful sweet milk and some little crumbly bits of cereal left. Enjoyable, but definitely different. Tierra Farms Cornmeal Ciabatta Roll. $0.75. 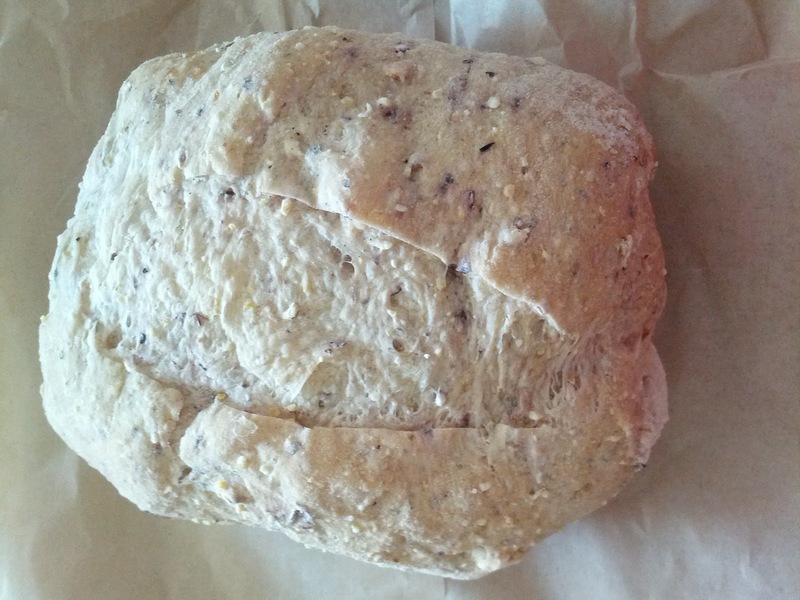 Les Elements recently started offering breads at the market on Tuesdays only, so I decided to try one out. I went for the small sized cornmeal roll. But ... I think it had a sourdough base, and being a horrible San Franciscan, I just can't stand sourdough. I did like the texture from the cornmeal and the heartiness to it. It had a good crust on the outside. I mostly didn't quite know what to do with this roll. Cold, it was just a roll, unremarkable. I warmed it in the toaster oven, and liked it much more, but it was still just a roll. I tried it with some butter, with some strawberry jam, and even made a mini pb & j. None quite seemed right, although the butter was the best. $0.75 was a good price for a roll, and I appreciate that they sell single rolls, rather that requiring me to buy a dozen at a time. The cookie had an interesting flavor from the cardamon, but I didn’t really like it. It had a nice heartiness, but was a hard style cookie, which I just don’t care for. As I mentioned last week, I recently attended my first Giant's game. Being in San Francisco, it was of course not exactly warm. My friends assured me that after a bit of alcohol I'd stop caring about how cold it was, but in the meantime, I decided to start with a warm drink. I saw many stands offering Irish Coffee, which sounded perfect, except that none had decaf, and I try not to have caffeine later in the day. The regular coffee stands had decaf, but no booze. I was trying to kill two birds with one stone, so just drinking a plain decaf wasn't what I was going for. 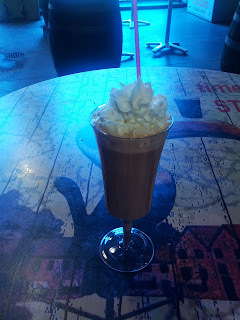 When I struck out at the last stand advertising irish coffee, I noticed that they also had hot chocolate with Bailey's. Still more caffeine than I really wanted, but a decent compromise. Side note: they also had better looking fish & chips than what I'd seen at the other stands (still already laid out in baskets under heat lamps, but less limp looking than the others I'd seen). If I wasn't totally full of crab at that point, I probably would have tried the fish & chips too, as I've been craving fish & chips pretty much nonstop since my last visit to the east coast, and I still haven't found anywhere around that I like. Not that I'd really expect these not-fresh ones to be great. Anyway. Back to the drink. Hot Chocolate with Bailey's and Whipped Cream. $11.50. The hot chocolate came in a fairly fancy looking, albeit plastic, cup. I was expecting a paper cup, so this was a nicer presentation. The hot chocolate came out of one of those automatic machines. I wish I'd realized that before I ordered. It was watery, lukewarm, and not really chocolatey. It was brown, but had no flavor. I guess I didn't need to worry about the caffeine content after all. And I didn't taste any Bailey's. The whipped cream was generic and came out of a can. This was so meh. As it was barely warm, it certainly didn't serve to warm me up in any way, which is why I got it in the first place. I don't know how it had so little flavor, seriously, all I tasted was slightly sweet water. For $11.50 it was incredibly disappointing. Certainly wouldn't get again. I normally review only chocolate on Sundays, but I wanted to expand my horizons a bit this week, and move on to regular candy. You know, flavored sugar. I don't normally go out and purchase candy, but I gladly eat it. And luckily for me, my mother likes to throw this sort of thing into gift boxes and Christmas stockings, so I get plenty. 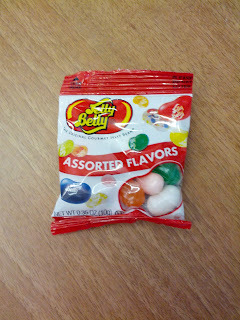 I know it is just flavored sugar, but I do love things like jelly beans, gummy candy, and sour straws. My multivitamins are the gummy kind, and I look forward to vitamin time every day :) So it shouldn't be a surprise that I have strong opinions about the quality of my flavored sugar! Jelly Belly is probably the most popular jellybean manufacturer in the US. They make 50 flavors, ranging from the standard ones, to sour ones, to the dreadful buttered popcorn. If you've ever had Jelly Belly, you know what I'm talking about. It is the flavor that ensures that you never eat a bag of these in a dark room, or absent-mindedly just dip your hand in. Shutter. Berry Blue: Sweet, sorta that fake blue raspberry flavor I remember from slush puppies growing up, not like a real fruit, but not bad. Buttered Popcorn: Probably their most famous flavor, as it is totally disgusting. But damn, it sure does taste like buttered popcorn! My least favorite flavor, always. Chocolate Pudding: Ok, wow. Yes, that tastes like chocolate pudding. Well, like chocolate pudding from a plastic container. Do not like, at all. Dark Chocolate Covered Raspberry Beans: low quality dark chocolate around the jelly beans. Sorta like a choco gummy, except not tasty. Would not get again. Green Apple: Mostly just sweet, with a tiny bit of apple juice flavor in the finish. Not bad, but not good. Lemon Lime: This tastes exactly like Sprite! Very sweet. A bit tangy. Not bad. Licorice: not bad! tastes like licorice! Orange Sherbet: This did taste like sherbet. It had a creaminess to it. But not a ton of orange flavor. Raspberry: Nice berry flavor, not too sweet. I liked this one. Unfortunately, my giant bag has only one!!! of these. Red Apple: About the same as the green apple. Sorta tasted liked apple juice, not a real apple. Meh. Root Beer: yup, tastes like root beer. Strawberry Cheesecake: Don’t really get the strawberry cheesecake flavor. Strawberry Jam: Pretty tasty. Decent jammy flavor. Sour Apple: Nice sourness! And sweet. Pretty good. Could have been even more sour, but one of the better flavors. Sour Cherry: My bag was supposed to have some of these in it, but I never found any. Perhaps I couldn't distinguish from the Very Cherry? Sunkist Lemon: Kinda tangy lemon flavor. Kinda unremarkable. Very Cherry: These taste like cold medicine. Well, obviously, the cherry flavored kind. Do not like at all.